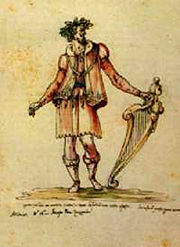 Jacopo Peri, in costume for the performance of the first opera, Dafne. Jacopo Peri (August 20, 1561 – August 12, 1633) was an Italian composer and singer of the transitional period between the Renaissance and Baroque styles, and is often called the inventor of opera. He wrote the first work to be called an opera today, Dafne (around 1597), and also the first opera to have survived to the present day, Euridice (1600). Peri's development of the opera and the dramatic vocal stylism of his arias and recitatives revealed his interest in the unity of the musical sections of the staged drama as well as the structure of the opera as a whole. The unity of content and form reflects Peri's interest in operatic content and form creating a harmony and cooperation within an art form which communicated to humanity about life, death, and the divine will. Peri was probably born in Rome, but studied in Florence with Cristofano Malvezzi, and went on to work in a number of churches there, both as an organist and as a singer. He subsequently began to work in the Medici court, first as a tenor singer and keyboard player, and later as a composer. His earliest works were incidental music for plays and madrigals. In the 1590s, Peri became associated with Jacopo Corsi, the leading patron of music in Florence. They felt contemporary art was inferior to classical Greek and Roman works, and decided to attempt to recreate Greek tragedy, as they understood it. Their work added to that of the Florentine Camerata of the previous decade, which produced the first experiments in monody, the solo song style over continuo bass which eventually developed into recitative and aria. Peri and Corsi brought in the poet Ottavio Rinuccini to write a text, and the result, Dafne, though nowadays thought to be a long way from anything the Greeks would have recognized, is seen as the first work in a new form, opera. Rinuccini and Peri next collaborated on Euridice. This was first performed on October 6, 1600, and, unlike Dafne, has survived to the present day (though it is hardly ever staged, and then only as an historical curio). The work made use of recitatives, a new development which went between the arias and choruses and served to move the action along. Peri produced a number of other operas, often in collaboration with other composers, and also wrote many other pieces for various court entertainments. None of his pieces are performed today, and even by the time of his death his operatic style was looking rather old fashioned when compared to the work of relatively younger reformist composers such as Claudio Monteverdi. Peri's influence on those later composers, however, was large as the dramatic vocal style of the early Baroque opera was pioneered and encouraged by Jacopo Peri. This page was last modified on 2 April 2008, at 14:05.